Sometime in the mid-Nineties my ex-wife heard there was a great hike in Southern Sinai, where, while standing in Asia, one can look out over Africa. I liked the sound of this, so we went to the Egyptian embassy in Tel Aviv and got visas to South-Sinai (it was outside the Sinai coast area where Israelis have visaless access). These were the years of the Israeli-Palestinian peace negotiations and before the rise of al-Qaeda. Sinai was a pretty safe place at this time. We caught a rickety bus which goes from the Egyptian border with Eilat to Cairo. 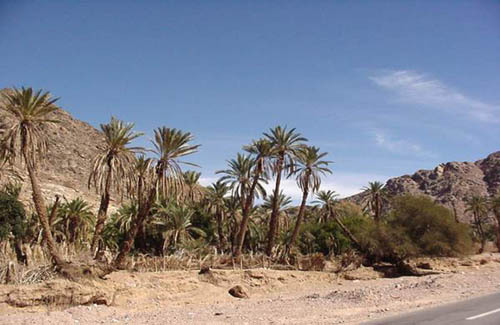 The bus slowly crossed Sinai, and after the better part of a day we got off in Wadi Feiran, which is thought to be the site of the biblical battle of Rephidim, where the Israelites beat Amalek and which contains a palm tree forest. In Feiran we made our way to a Byzantine convent called Deir el-Banat. The convent is 1,500 years old and looked completely alive (though a bit empty). At the convent a woman, who I suppose was a nun, looked a bit astonished when we told her we were looking for a Bedouin to guide for the Serbal, but sent someone to find a guide. They returned with a tense 15 year old boy who spoke neither English or Hebrew. He demanded some 800 Egyptian pounds to be our guide (a lot of money in Egypt) and did not back down. I can't remember what sum we agreed on but it was much more than we expected. We were carrying heavy back packs containing food and clothes for several days and our bedouin guide raced up the side of the Serbal mountain range, which is about 2000 meters at its top, so it was exhausting. At the top it was a plateau and much more pleasant. After a couple of hours hiking through desert, we hit a beautiful field of flowers. I remarked on how stunning they were and he scornfully told me there were much better flowers ahead. Indeed there were. We came to a large field, with a hand-dug well and a battery powered pump supplying water. It was very impressive, except that in between the flowers were large Cannabis plants. That and the pods on some of the flowers left no doubt: This was a poppy field. A couple of small children were working in the field. There was a small handmade tent next to the well which our guide happily entered, motioning for us to join him. We went in and find ourselves sitting in a small space with a bunch of bedouin stoners who were clearly his mates. Fortunately they were older than him and a couple had been through the Israeli education system so they spoke Hebrew and we could communicate. My ex-wife was nervous: "Be careful not to show them the soles of your feet" she advised "Its a grave insult among bedouin". This struck me as silly. Would men who had built such an impressive cultivation system be offended by where I put my toes? Besides it was uncomfortable to try and sit with my feet facing inwards. "Don't refuse to drink the coffee" That made sense. Act friendly. It was clear I needed to keep my wits about me so I refused the offer of a joint. I was happy to drink coffee I told them, but would pass on the offer of Opium tea. With hindsight the air was thick with fumes and it probably made little difference. Maybe the smoke made me feel comfortable but it was just like sitting in Paul George's bedroom as a teenager. It looked kind of similar and he always offered tea. There was a similar boyish cameraderie. I seem to remember that one of them was a taxi driver. "Who do you sell to?" I asked. The bedouin who spoke good Hebrew told me that a guy came up from Cairo to buy their wares. "Aren't you afraid of the authorities?". He said that the path up the mountain was difficult and the army would take a long time to get up it and they would hear long before and disappear into the desert. This made sense to me. The desert is very quiet and up in the hills noise travels easily. During the day a bedouin can spot a man walking at vast distances - far more than an outsider - because nothing moves in the desert. The bedouin learn to spot tiny movements across the desert and can tell when it's a man. I was sure they could race up or down the sides of the mountain range, which they obviously knew intimately, much faster than Egyptian soldiers could get around using the unpaved roads. There was an old single-shot rifle on the wall of the tent. Possibly first world war vintage. I asked about it and he proudly took it down and displayed it. There was much amusement at my horror when I found it was loaded. The previous year, he said, the army had raided them. A helicopter appear at night and "shots were fired". He said this with appreciation of the gravity of what had transpired. The shots, he said, gave them time to flee into the desert. I spent most of the rest of the evening planning how we would run into the desert if anything happened. I did a lot of desert hiking at the time and felt confident I could handle a blind race into the desert if I had to. The bedouin explained that the Egyptians refused to give them jobs because they had lived under Israeli rule and claimed they had no choice but to turn to this line of work. He asked me if it was true that half of the Jews in Israel came from Arab countries. I said it was and he said that if so, Israel was an Arab country. I was quite stunned by this remark, which I still think was a great insight. I would eventually make this point on the Wikipedia Arab-Jews page. I'll write about that in another blog because it would take too much space to discuss here. I asked how much the cannabis cost and was told they could sell me a sack of the stuff for some ridiculously small sum of money. I briefly imagined the logistics, thought about spending forty odd years in an Egyptian prison and explained that I would probably not be indulging. By now it was pitch-black outside and I said I thought we should go and find somewhere to sleep. They took charge and showed us to a cave nearby, which was full of sacks of cannabis, and that is where we slept. The next day went to the edge of the Serbal and looked out across the Suez canal into Africa. Then we started our descent from the mountain range. The path we followed down the mountain side went through a series of different rock formations, each of which was composed of the sort of stones you see on sale in new age shops. As we walked, we would go through a whole field of say green rocks, and then red rocks. It was beautiful. We saw extensive terraced farming, with whole Bedouin families cultivating poppies on small, probably Byzantine-constructed (1500 year old) terraces. In the valley there was a large mud brick village, which we walked through to the road. After parting from our guide, we hitched a ride in a small van with a friendly Egyptian school teacher. His van was packed to the rafters with toys and school teaching implements like pens and exercise books which he apparently sold to augment his salary. He dropped us off on the main road to Sharm-El-Sheikh, where we easily caught a ride with a Mercedes going to Sharm. Sharm-el-Shiekh had millionaire's yachts anchored in the bay. It was full of five star hotels, which in contrast to the ones I've seen in big cities were single-storey hotels with the rooms as bungalows. There was a beautiful restaurant on stilts in the Red Sea where we sat down for our first decent meal in a week of so. It was the best meal I've ever eaten. My ex-wife took a poppy pod home as a momento and after it had dried out I removed the seeds and stuck them in a little plastic box. Years later we took all the seeds we had lying around the house and threw them in the front garden. We no longer remembered what they were. Only one type of plant grew and it had beautiful flowers. It was only when one of the flowers dropped its petals, revealing a very evil looking pod, that I recognized the plant growing in my front garden. I quickly got a pair of scissors and removed the pod but because the flowers were very beautiful, I left the ones with petals. It turned out that if you remove the pod they put out even more flowers in a desperate drive to generate seeds. I decided to leave a couple of hidden pods among the flowers for a possible second wave. After a couple of weeks one of our neighbors spotted the pods, identified the plant and quickly rushed in and uprooted all the flowers thus ending my career growing opium poppies. A few years later I had a holiday in Gibraltar, where I climbed the rock and saw Africa. It was just like the Serbal except I was in Europe rather then Asia.